Keto Mocha Coconut Milk Ice Cream, A Dairy Free Treat! Have you been searching for a dairy-free, sugar-free and low carb keto friendly ice cream recipe? Well, what if I told you that my keto mocha coconut milk ice cream is, plus it’s churn free? Here in South Florida we are already experiencing 90 degree days. Understand it’s not even officially Spring yet. I know this may sound like a complaint but it’s more of an observation. I love living in Miami, it really is a melting pot of cultures. However, the humidity factor can be a challenge as the temperature continues to rise. It’s frankly hard for me to believe that there are places in the United States right now that are still experiencing snow. Don’t misunderstand me, I passed my junior high geography class. It’s just that when you are already sweltering from the heat in the middle of winter, well its tough get pass that. I know I should be grateful that all this humidity its great for my skin. However, this still does not mean that living in this type of weather isn’t a challenge at times. Understand that this was a very mild winter for us. If I tell you we had like two days of winter weather, I may be stretching the truth. Unless you consider two days of 40 degree weather cold. So how do we cope? By indulging with this keto coconut milk ice cream of course! Because my oven is taking a much needed break. Don’t get me wrong I still bake keto goodies during the warmer months, but an easy treat that requires no heat makes perfect sense right now. I hope you enjoy this easy no churn keto mocha coconut milk ice cream recipe. A super easy low carb chocolate keto ice cream that needs no ice cream machine. In a mixer blend all the ingredients until fully combined. Pour into two loaf pans or other similar container. 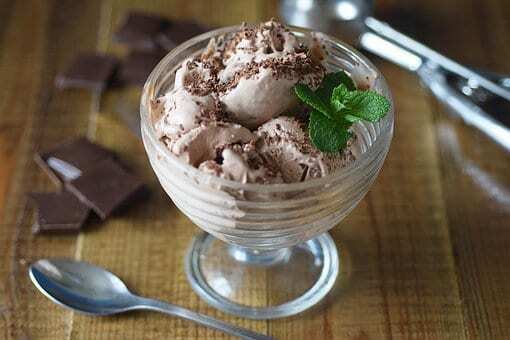 For a creamier version place in the freezer and every two hours stir the ice cream with a fork. Going Low Carb? Avoid The 5 Most Common Pitfalls! I wish my tummy could handle Swerve, xylitol, etc. I ate well like this using the sugar subs...lost weight...but ended up having to have an endoscope on my stomach because it was always hurting. I stopped the substitutes...tummy better. I ended up putting on 10 lbs, which is ok. But I love to bake, so not sure what to do for a sweetener. Tx for your posts! Hi Donna, our doctors have personally told us that Splenda although frowned upon by many will never cause the harm that obesity brings. Stevia is a healthier choice but many people cannot handle the aftertaste. We use Splenda from time to time and have never had any issues. In the end it's a personal decision and one you may want to ask your doctor. What we tell people is to stay away from Equal. Best wishes. Can you still make this in an ice cream machine if you want to? Hi Marcy, You sure can darling!